The only car that seems truly stereotyped for multiple ownership in a crazy cat lady kind of way is the Corvair. With most other car hoarders, it usually seems to be a mixed make field of broken dreams of various makes of car in disrepair. But what if you took those wacky Corvair-hoarding tendencies and applied them to something way harder to find? Wouldn’t that naturally limit the amount of cars you could accumulate? Well, not if you’re this guy and your poison is English Fords – his hoarding superpowers mean he has an entire backyard full of Cortinas and Anglias, some of which he’s now offering for sale. 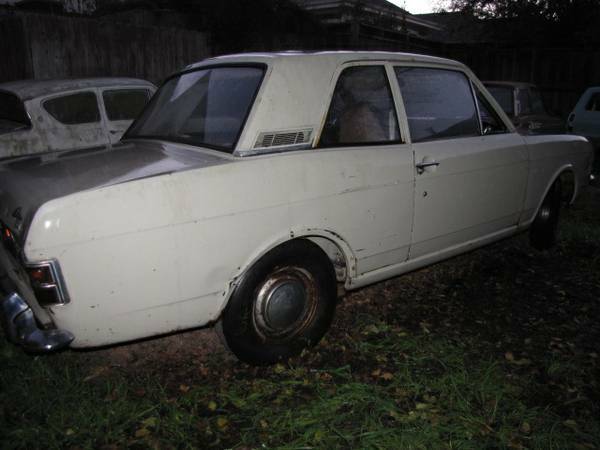 Let’s take a look at a couple of the most appealing offerings, starting with this 1968 Ford Cortina 4-door for sale for $1500 in Oakland, CA. Like its more popular Japanese competitor, the Datsun 510, these were family sedans with a high fun-to-drive quotient. Thankfully, online resources for North American owners of English Fords are out there, and the seller also says he has parts available. This car with its original black and yellow California plates is said to be in generally straight condition, though you can probably expect a sun-baked interior. In addition, the head is off, so the engine will need a rebuild, if not replacement with something that hasn’t been exposed to the elements. 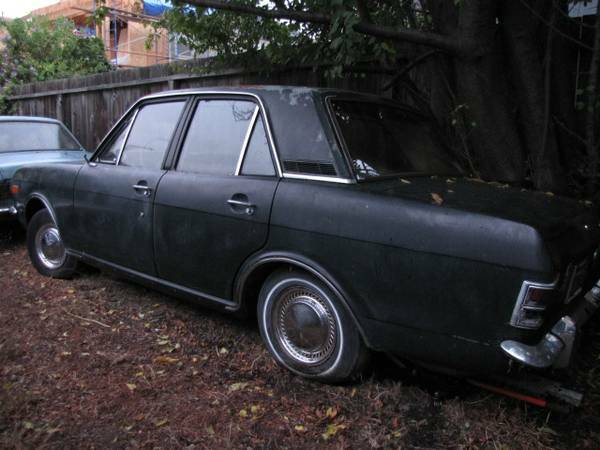 Fortunately, as with the 510, parts should not be too costly, and it’s a fairly simple car. On the plus side, it’s equipped with a 4-speed manual, so combined with some minor powertrain upgrades (while you’re in there, you know) you should be able to make something pretty fun for budget rallies, and perhaps without doing too much on the cosmetic side. 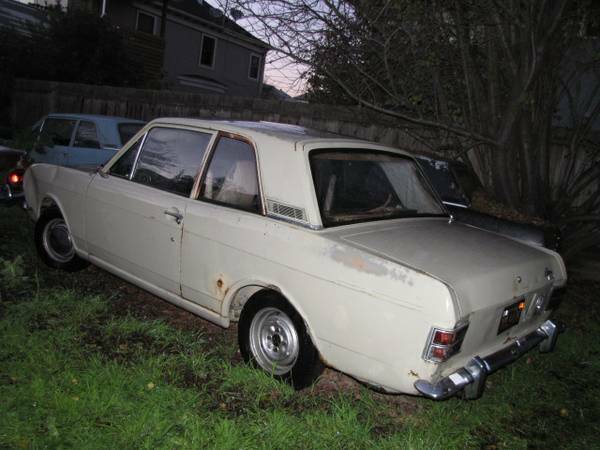 However, if you want more control over who has access to the back seat, the seller has you covered – check out this 1969 Ford Cortina deLuxe two-door for sale for $1650, also in Oakland, CA. This car looks a little more wrinkled, but still not a hopeless case. A little wet sanding, polishing and waxing would make this thing look nice for at least a couple weeks. It’s said to have run a couple of years ago, but is now needing a battery and carb cleaning – okay, might as well rebuild it while you’re in there. Similarly, it seems to be wearing its original black and yellow license plates, and looks like it was last registered in 2011. The two-door naturally lends itself to more sporting builds, though you’d really want a GT if you’re going that way. Since you’re not getting the cool GT interior either way, it would be more fun to do a stealth build on the 4-door, maybe with a set of Minilites or Cosmics to hint at what’s going on underneath. Looks consistent on both sides – at this point it’s probably not worth redoing the body, at least if you’re expecting anything back on what you put in. But that’s not what it’s about, is it? So get the engine in shape, do brakes and exhaust, some new tires, and start thinking about suspension tune while you’re ironing out the bugs. You won’t be like the ten other BMW 2002s and Datsun 510s at the budget rally, but you’ll have just as fun and reliable a ride. And if you’re bent on having a reverse-slanted window, or a wagon, the seller’s got you covered too. This entry was posted on May 20, 2015 at 4:36 pm and is filed under Feature. You can follow any responses to this entry through the RSS 2.0 feed. You can leave a response, or trackback from your own site.